Just thought i'd start a thread about the circuitbenders.co.uk Harmonic Engine PCB. 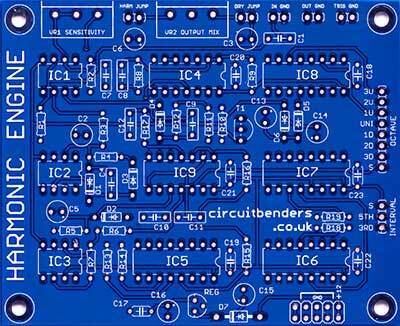 "......The circuitbenders.co.uk Harmonic Engine PCB is a clone of the E&MM Harmony Generator. This was a project originally designed by Paul Williams, and published in Electronics & Music Maker magazine way back in 1981. The circuit uses a 4046 Phased Locked Loop (PLL) to generate a squarewave oscillator output at harmonic intervals to the frequency of an input signal. The squarewave generated can be set to plus or minus up to three octaves from the input, and can also produce 3rd or 5th harmonies. Thats the theory anyway. In practice the note tracking only works reliably if you use very basic waveforms at the input. If you use anything else, then everything very quickly descends into a beautiful kind of chaos, with all kinds of bizarre gurgling digital squeaks and squeals vomiting forth. Its especially effective with percussion sounds, converting each hit into some kind of warped electronic splatter." If anyone comes up with any interesting builds or mods for this board then i'm more than happy to put up a post and link on the circuitbenders site. i love me some 4046 sharty goodness. were can I get it from? 4526's do appear to have proven unexpectedly difficult to get hold of. that is really interesting, is that you offering this project,or are we ordering from circuitbenders.co.uk ? is that you offering this project,or are we ordering from circuitbenders.co.uk ? Sorry, that might have been a little confusing. I run circuitbenders.co.uk, but as i keep getting sent emails asking if i know of any mods or if i can supply eurorack panels etc, i thought i'd start a thread on here so i could point people in this direction. You can buy a PCB through the circuitbenders site. I've put in a link on the first post. but what happens when you realise you need 2? CPC have been showing only 1 in stock for the past couple of weeks. As for mods, maybe compare schematic to BMC 4046 shaper? Is there a schematic for this thing? Nice, definetly getting one if someone sources the rare ICs. So that's how Prodigy does it. Great sounding project I really like the way circuit benders use electronics so creatively in unexpected ways. Can you please let me know what difference would it make if I use mylar caps instead of poly film? Are any crucial? Will it run at 15V? Thanks! I'd be astonished if it made any difference whatsoever. As far as i know mylar is just a brand name for a type of poly film cap. A load of super cheap green mylar caps were given to me - just don't want to blow any of the chips that add up if I have to replace. only one via! great pcb design right there. did you also make a guitar PCB? hmm this atleast is readily available. need a converter. anyone got a good source for pcb to convert SMD to DIP. maybe it could just be fudged by bending pins? Sparkfun. Or rummage around in my misc parts drawer.